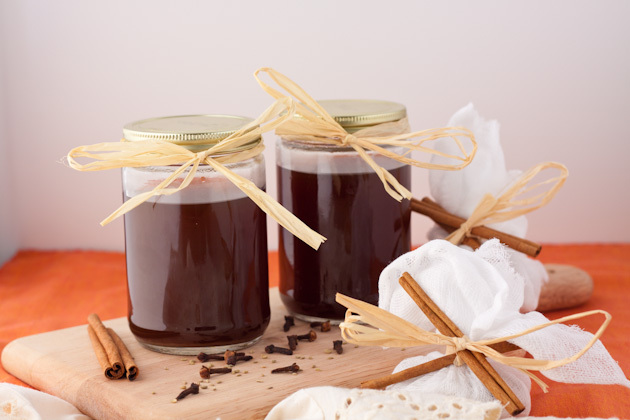 Refined sugar-free chai concentrate makes a great gift for someone special, or just for you! 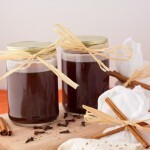 Lay cheesecloth flat and begin placing ingredients on top. Begin with tea bags, then vanilla bean, ginger, cloves, cardamom, and aniseed. If you’re using cardamom powder, sandwich in between 2 teabags to prevent it from dispersing into the mix. Bundle everything into cheesecloth and pinch together. Tie with twine and tie 2 cinnamon sticks with the twine. Place water and coconut sugar in a medium sized saucepan, cover, and bring to a boil. Reduce heat to a simmer and put the cheesecloth bag in. Simmer for 20 minutes. Allow to cool before pouring it in an air tight container [mason jars works well] and placing in the fridge to cool. To enjoy as a iced chai latte, combine 1 part concentrate to 3 parts non-dairy milk. Serve on ice.